Jack Adkisson is a former collegiate football star at Southern Methodist University and played professionally with the Dallas Texans. Jack Adkisson began his pro-wrestling career under the name Fritz Von Erich, working under the premise of being a Nazi sympathizer..
November 1966: Fritz von Erich had his first match in Japan (where he was billed as being from Berlin, Germany)..
As a promoter, Fritz von Erich worked with the governing bodies of the NWA in promoting the sport in his native Texas. Fritz von Erich formed World Class Championship Wrestling headquartered in the Dallas/Fort Worth, Texas territory..
Fritz von Erich’s dream was to build an entertainment empire – his plan was to use his sons as the foundation to build that empire. 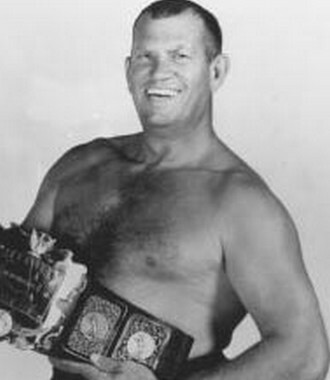 June 24, 1972–Parade of Champions: Dory Funk Jr. (NWA World Champion) vs Fritz Von Erich wrestled to a 60:00 time limit draw..
June 4, 1982: Fritz von Erich (Retirement) beat King Kong Bundy in a “Falls Count Anywhere” match to win the American title..
May 6, 1984: Fritz came out of retirement and teamed with his sons Kevin & Mike and they defeated The Freebirds in a 6-man Tag..
~~~But that night will long be remebered for Kerry von Erich defeating NWA champion Ric Flair with a backslide at 25:42..
October 12, 1986 — WCCW: Bruiser Brody defeated Abdullah The Butcher in a Cage Match with Fritz Von Erich as the referee..
November 27, 1986 — WCCW Star Wars: Fritz Von Erich defeated Abdullah The Butcher via DQ in a “Submission” Match..
September 10, 1997: Fritz von Erich found dead at his home in Lake Dallas.. [read more].